The Commer TS3 2-stroke Diesel sounds like the weirdest race car. It's bizarre. It's a truck. With A three cylinder, six-piston, opposed (literally) engine, that...well....it's supercharged and sounds like 6-zillion rpm when at 2,400. Have a listen, try to hear the configuration, and the blow-off valve, and then jump below to see what the magic weirdness is about. There is one crankshaft underneath, connected to six connecting rods to six rockers pivoting on the outside, connecting to six more rods to six pistons squeezing together in three cylinders to the middle. It's piston ported so there's zero valves, like a regular two-stroke, but this was actually clean and efficient....mostly. On the right port, the supercharger blows in the air, and its squeezed to direct injection of diesel and combustion. 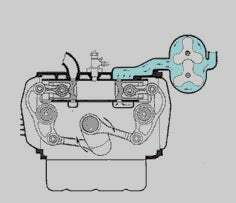 After combustion, the piston on the left opens the first port, exhaust, where it initially escapes and then the right side port opens momentarily after and the supercharger blows air in, blasting out the exhaust and then the ports cover up and it squeezes clean air to injection again. So, are you confused yet? It's what Junkers did in their aircraft and blimp engines in the 30's and 40's with incredible fuel efficiency. So, what's it look like all together? Listen to her rev! They were built flat and compact. 3.3 liters, 105hp at 2,400 and 270 lb. ft. at 1,200 rpm. This was used in trucks from 52-63 and it was a success! But...it was so noisy! Tour operators and tourist destinations hated the sounds, but it was so incredibly reliable and efficient of the day. Many many of these engines survive today running power generators, in boats, in just old trucks sitting forever and then starting out of nowhere decades later to wake the neighborhood three counties away. They called them "Knockers" from that big bark.